Ryan Rydel has extended his contract at Fleetwood and hopes he is the lucky omen Town need to fire them into the play-offs. Joey Barton’s team have won both games since the teenager came into the starting 11. Speaking after signing a contract extension that will keep him at Highbury for at least the next two seasons, Rydel said he wants to end this campaign on a high. It has been a meteoric rise for the versatile left-footer, who only signed his first professional contract in October. 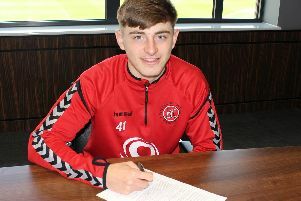 And having broken into Barton’s first team, the 18-year-old has been rewarded with a new deal that will keep him at Highbury until June 2021, with the club holding an option for a further 12 months. After impressing Barton with his displays for Simon Wiles’ Under-18 side and in training, Rydel made his League debut off the bench in the 2-0 defeat at Walsall last month. Now Ryde is hoping to help Barton’s men to three straight League One wins for the first time this season. Rydel said: “We have won the last two games that I have started, so hopefully we can win the next game and keep up this winning streak. Hopefully I’m a lucky omen! Rydel says it has been a whirlwind start to his professional career as he has progressed from the Under-18 side to become Town’s current first-choice for the left wing-back role. He said: “It is a happy time for me and my family. I now have an extra year on my contract at Fleetwood Town. “I’ve made four League appearances (following his senior debut last October against Rochdale in the Checkatrade Trophy). And Rydel says he feels part of the squad already after Town’s senior players welcomed him into the pack. He said: “They have been great with me. They always come and chat with me, sit next to me, make me feel welcome, even when I was just on the bench and travelling.